Well, we don’t always like to talk about stuff that’s still so far out in development that it may not happen. If it doesn’t have a distributor’s sku number attached to it, I prefer to wait until it does. But so many people have been emailing me about the possible upcoming Hot Wheels Batcopter that I thought we’d talk about it a bit. AND since they (Mattel) *borrowed* a custom Batcopter photo from a fellow customizer, I have no issue messing with their wrath, as it were. The little Batcopter in the cluster photo is a custom 1:94 scale (roughly 1:64 or Matchbox/HO car size) Here’s how we get the scale by the way – the real Batcopter (Bell 47) is 31′ 7 long. That converted down to the 4″ scale of this little diecast is roughly 1:94 scale. But it fits in well with the 1:64 scale Corgi or Hot Wheels vehicles. And we used foreground forced perspective to make it look right with the other 1:50 vehicles in the photo. But likely the real Hot wheels version will be bigger and out of scale with these vehicles. So – first lets get the factual info out of the way, because it’s really minimal right now. Yes, the HW Batcopter is “confirmed” as going into production in 2012. And it will be part of the 1:50 line. That doesn’t mean it will be 1:50 scale. Only that it will be on that general card size. Like the Batcycle which was closer to 1:35 scale, it just needs to be part of that same blister-card set of vehicles for Hot Wheels to call it 1:50 scale. Remember folks, they’re a TOY company. Not a scale-model company. They don’t care about you. Only about your cash. That said, they did such a nice job with the Batcycle and Batboat that I’m personally stoked about it. Polar Lights has also hinted that they are not ruling out a Batcopter model kit in the near future. But all of that plus about $4.50 will get you a cup of iced Chai at Starbucks. It’s all wishful thinking until we get wind of a Sku. Few shots exist looking down on the copter from directly above, but enough evidence has been collected over the years by those in the know that reveal that the flattened shape of the wings actually form a swoop-out, like a stylized, drapy “V” from the cockpit. Here’s a custom mego-sized copter from above that was not designed for scale accuracy, but which shows the wings close to their correct shape. One of the best shots indicating the wing shape is a vintage photo that shows a planned Batcopter model kit from a well-known model company. The accompanying drawings and mock-up photos show what appear to be researched measurements and dimensions. The challenge after getting the right shape is to then curve them upward correctly, so they take on the correct parabolic effect. What was achieved with struts in real life is a bit of a challenge to get right (and symmetrical) in a scale model. Note that in these model company leaked shots, they also took some liberties with the wings, as they’ve added a “wavy” batwingy strutted-panel look to their curves which were not present in the real Batcopter. Flattened 1966 TV Batcopter wing pattern. Lets hope that Hot Wheels does as good a job on their 1966 TV Batcopter research as they did on the Batcycle and the Batboat. (not that they were perfect, but they were certainly better than expected) We’ll let you know when we have any release data. 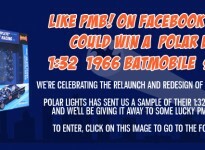 We’re Giving Away A Batmobile! I would love to see a 1/50th [1/48th] Batcopter. Not only can the Dark Knight patrol the sky above my O Guage train layout but also be a part of the Batman train I’m plainning to make! Hey guys, well, I was just contemplating a new Bat-copter build when I got your latest news letter, so I popped on over to the site and what do I find? My copter on PIMP! I’m the kind of guy who appreciates constructive criticism, so, if and when I finish my new build, I’ll drop you guys a note about it. I had no idea (obviously) about the real shape of the wings, but now I know, so thanks! Hey Cesare! Sorry for calling you out unannounced. We could have shown MANY other Batcopter conversions that also employ the same wing shapes as yours. Lots of modelers have done them this way. But yours was just the best looking example we found quickly. And to be fair, the wings on my old conversion (pictured above)might be shaped correctly, but it’s got plenty of other issues. You may want to hold-off a bit longer on doing another, as there have been some whispers and conjecture from Polar Lights about a possible Batcopter model release. But no official word yet. I’ve been dying to redo mine and am trying to be patient too. Watch the skies! I will indeed wait a bit longer then, while I’m not really a stickler for exacting detail, I don’t really have the skills for a great kit bash, so a ‘real’ Bat-copter would be fantastic for my Bat-shelf! that you still had at least 2 more of the “repro clear canopies for the 1966 Ideal Batmobile “. I have 2 of these cars, one with the factory silver painted accents and one without. Would you consider making me 2 of the canopies from your molds? If you won’t agree to do it, how will I ever obtain them?? The cars would look soooo much better with the canopies! Would you consider doing this for me for a fair price? I was 7 years old in 1966 and still a huge fan of the Batmobile! Hi Eddy, I’ve emailed you back a few times as well. :) Check your junk folder and email me again through the Contact section on this website. But the short, sad answer is no – we don’t have any replacement canopies for the Ideal car and never had any molds for them. When we produced the repro playsets (in the 90’s) we got those parts from a place that specializes in clear parts. We don’t manufacture plastic parts here. We rely on specialists for that. 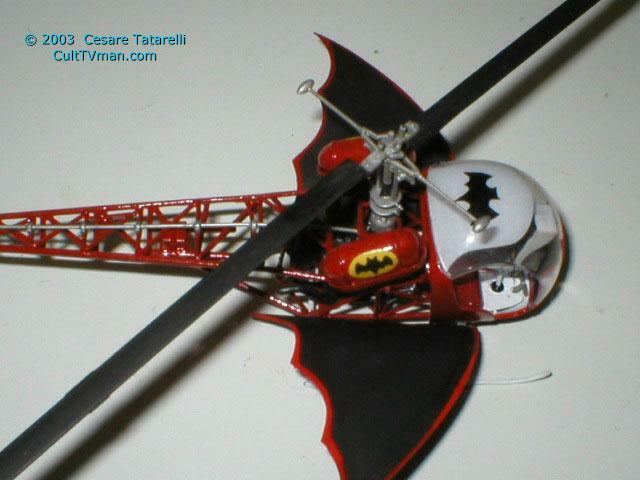 It was great news that Hot Wheels have made the model of the the 66 Bat Copter. I am hoping that a 1:18 scale model for both the Bat Copter and the Bat Boat with traler will be out in the near future. It would also be great if a box set could be released containg the Batmobile, Bat Boat & Bat Copter all in one. Corgi did this so come on Hot Wheels.. Concerning the TV series..are we any nearer to the 120 episodes ever getting to DVD release.